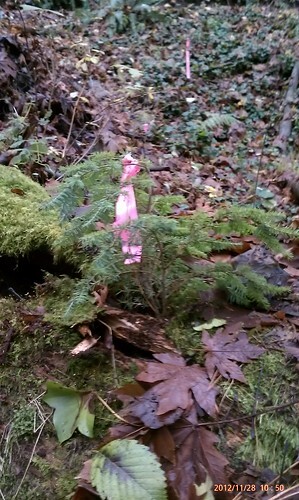 This morning Drexie and I put about five hemlock trees into various places in the park. We didn’t take pictures of all five, but this one in particular was so amusing to us I thought I’d share. It’s not very apparent from this photo, but this tree is planted directly into a nurse log. This is, in fact, a situation in which you’ll see hemlock trees growing in the wild, so this just might work. This log may have been on the ground for decades. There was enough actual dirt where we planted the tree to give its roots good coverage. The other places we planted hemlocks were also close to much coarse woody debris and rotted wood. And then the rains started up again! So they’ll get a good watering now, as well.